Talk about rock'n'roll doesn't offend Evelyn Cipollina, a classical pianist who is mother of "Mr. Flash" - News bass player Mario who doesn't smile or sing. In fact, this woman, a seventy years old Mill Valley resident, uses the words "gigs" and "great rock music", as if she was there ... but the fact is, Evelyn Cipollina was there! She's been on the Bay Area rock music scene from the start. Her married name "Che-poll-lena", (meaning "little onions"), Evelyn is the mother of two who have made it to the top of rock'n'roll success ... eldest son John in Quicksilver Messenger Service at Bill Graham's legendary Fillmore and '60s Avalon Ballroom; and her youngest Mario, in Huey Lewis and the News. Now how does a classical concert pianist mother mix with rock'n'rollers? "It's all her fault," cried out her second daughter Antonella. "It's her influence that involved us all in music!" "Well, I do believe all children should have music lessons," said Evelyn. An evening with the Cipollina clan is a family affair. Nothing stays still very long, not even the decor of the house. "My mother is a great eclectic," pointed out "Mike" (who doesn't like to be called her real name). She and John are twins, oldest of the four children, Antonella second, and Mario, the baby. Different friends come and go. The children are all in their thirties to forties, and stay close to home. "After my husband Gino died, I was all alone for the first time in my life for three months. But then one day Antonella called and she wanted to move home. I was so glad." In the middle of the living room are two baby grand pianos. "One's for Antonella and the other is for me!" Evelyn, a Sacramento native, met Gino, her late realtor husband, who was a trained opera singer, native of Genova, Italy, and an anti-fascist expatriot. "We used to have so much fun together," she smiles. "He would sing and I would play the piano." Then, the living room wall of the Cipollina house becomes the topic of discussion. Covered with posters of Quicksilver Messenger Service and of other sixties groups, it tells a story about when rock music was emerging into Marin's mainstream. "There were so many fun gigs back then," explains Evelyn. The concert pianist has now become a rocker. "My husband Gino and I always felt that whatever the children wanted was the way to go. 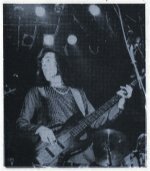 We went to every concert when John's band (Quicksilver) played. My very conventional husband was first skeptical, but he saw there was something here. The kids started to make some money. This picture (above) is of Mario at 15 in Stoneground. But Bob Brown is the one who's made Huey Lewis and the News what it is today, especially on Back To The Future movie. The boys haven't changed ... and Huey's so modest."